Western blot analysis of extracts from A431 cells, untreated or EGF-stimulated, using Phospho-EGF Receptor (Tyr845) Antibody (left) or the same antibody preincubated with Phospho-EGF Receptor (Tyr845) Antibody Blocking Peptide (right). 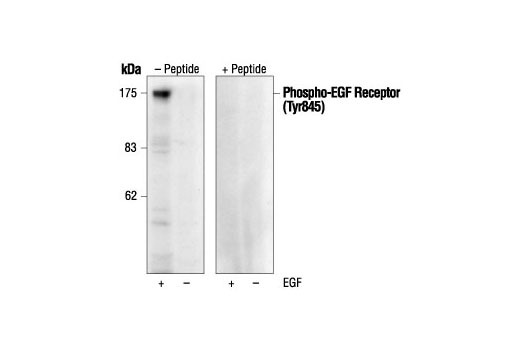 This peptide is used to block Phospho-EGF Receptor (Tyr845) Antibody #2231 reactivity. The quality of the peptide was evaluated by reversed-phase HPLC and by mass spectrometry. The peptide blocks Phospho-EGF Receptor (Tyr845) Antibody #2231 signal completely in Western blotting. temperature for 30 minutes before allowing to react with the blot. Supplied in 20 mM potassium phosphate (pH 7.0), 50 mM NaCl, 0.1 mM EDTA, 1 mg/ml BSA and 5% glycerol. Store at –20°C.